Writing down your goals is like creating a Playbook for success! Goals are a progression and represent a desire for change. Goals are meant to be challenging and difficult. So when there is a goal set into place, it needs to be deeply decided and planned. Clearly, success can be measured by the amount of accountability you put onto paper. Before goals are set in stone, there are a few things that should be considered. Start with small achievable goals and write them down. Be patient and stay dedicated on the small goals. Then step outside of your comfort zone, and take a leap forward . Utlimately, the small successes will pave a road towards your ultimate goal. If you keep focusing on achieving the end goal, you’ll undoubtedly get overwhelmed. It’s better to focus on smaller goals each month. For instance, instead of striving to increase profits by 120% over the course of a year, you should focus on increasing profits by 10% every month. It can be easy to stray from your business goals because so many different tasks and issues can pop up unexpectedly, but it is imperative that business owners and their team members stay on track. Measuring success helps keep a team’s motivation high, and that is a key component to achieving daily, weekly and monthly goals. Little wins add up to huge successes. Always keep your goals in front of you. By writing them down on paper, you will begin to see growth in both your personal and professional life. Friday, June 1st Fight Night Productions will put on a show at Tampa’s A La Carte Pavilion to showcase some of the Bay Area’s hottest prospects in boxing. I grew up in the Tyson/Holyfield ear… I mean “era.” And so I’ve always been into the sport. But my love for boxing has been replaced by my fascination with the UFC. And I’m not alone. Though I wince just seeing someone get their finger pricked for a blood test and feel it in my own kidney watching a fighter get a heel kick to theirs (which, by the way, is now illegal under UFC rules), I find myself enthralled with this gut-wrenchingly violent sport and not enthralled in a watching a train-wreck sort of way. My first (and only) live UFC event was in Vegas–Rashad Evans’ take down of Forrest Griffin in ‘08. The pageantry and drama of the whole night is what wooed me. But many fervent UFC fans have never even seen a live event. When you think about that fact and you think about what the ultimate fighters have been up against―political opposition and state licensing issues―, it’s an amazing feat. The main reason that mixed martial arts has become one of the fastest growing sports organizations on the planet has much to do with marketing, specifically content marketing. For those who are less familiar with the term, content marketing involves the creation and distribution of relevant and valuable content to a specific target audience. The UFC masters content marketing with a holistic attack. “The Ultimate Fighter” reality show on Spike TV does wonders for the sport, allowing fans a transparent view of what it takes to make it as a fighter, and the show endears fans to up-and-comers. Charismatic UFC President Dana White’s video blogs on the UFC’s web channel, which has over 370,000 subscribers, serve to fuel fans’ interest for upcoming events. The UFC uses long-form content for the pre-fight programming―documentaries about the fighters that delve into their family backgrounds and what drives them to seek fighting championships. And as far as social media content goes… Well, while most sports leagues are telling their athletes when not to Tweet, White gives his fighters incentives to use Twitter and labels Twitter as “the greatest marketing tool in the history of the world.” What do we tell our clients about posting and tweeting? Be inimitable. Be provocative. Be unforgettable. Be authentic. Yes, White is all of the above. In fact, he’s authentically authentic. As a business owner, you may say, “I don’t have the budget to create a reality television show.” Maybe not, but believe it or not, many of the marketing content strategies used by the UFC can be employed without a TKO to your marketing budget. If you are a business owner, you probably struggle with the same dilemma as every other business owner: the amount of hours in the day. We certainly cannot manufacture a few extra hours into the day to accomplish more tasks, and we cannot ask our staff to work round the clock. So, the best business owners figure out how to be most efficient with their time. Have you ever sat down to check your Facebook and then found yourself still scrolling the newsfeed an hour later? Social media can be a huge time waster, but social media is PR. It is a relatively cheap vehicle to relay and your company’s image and brand message to your target audience. There is no guarantee on this translates into immediate sales, but it effects how people feel about you and your brand. For this reason, many companies have opted for services that automate the social media portion of their marketing plan. While the automated approach seems great and frees up manpower, it may not be wise. NPR recently tested the effectiveness of having a live person working their social media in real time versus their automated approach. They were shocked by the results. During the five days of manual updating, traffic to the NPR website increased by 45%. Twitter links tweeted by @nprnews were clicked on nearly 100,000 more times than links shared automatically in the previous week. Sounds like a compelling reason to lose the robot. Here are Playbook’s “Top 5 Social Media Tips.” We hope they help bring NPR type results to your social media engagement. The #1 reason for outsourcing to a call center is that businesses do not have time to devote to the task of making and fielding calls. This approach makes sense in social media too. Marketing companies have account managers that are dedicated to servicing their client’s social media needs. They typically use a combination of a live person during office hours and then some degree of automation. 2. Give your posts a personal voice. Your brand has a voice. Speak in that voice and make sure that your social media sounds like there is a real person that cares about them and the world posting. 3. Separate business and personal pages/ posts. While people want corporate posts to be quirky and fun, they shouldn’t know everything about you. The smaller the business is; the easier this line is blurred. If you like to “party like a rockstar,” only a handful of potential clients will relate. The rest will be turned off and not want to do business with “Mr. Party Animal.” You also don’t want controversial posts on your company’s social media sites. It is usually better to save the controversial topics for your personal outlets. 4. Respond to all posts. Social Media can cause PR nightmares, so it is important to respond to your audience’s posts and comments quickly. In order to so this, your business needs a point person who can respond in a pleasant and appealing manner. Put a crisis management protocol in place, so all “hot” topics are sent off to management or customer service department for further action. 5. Automate some of the social media experience. While there is value to having a dedicated social media team, it may not be realistic. So, you will need to figure out how to automate a portion of the social media time while still allowing for personal connection. Hootsuite is a wonderful tool to help with automation. What is the bottom line? You need to get personal and friendly when it comes to social media without stepping into the twilight zone of losing time. If you plan out your approach, get some help from marketing experts, you should be poised to navigate social media with maximum effectiveness. The #1 reason most people “unfriend” someone on Facebook is because of offensive comments. Can you guess the #2 reason? Well, according to NM Incite (click here for more compelling Facebook usage facts), it’s because they feel they are being sold products. Based on this research data, I think it’s safe to say people do not want to see negative or offensive comments nor do they want to be constantly sold. Most people tend to seek out relationships that are positive, and this includes their social media contacts. Your friends, family, co-workers and bosses (let’s face it, pretty much everyone you come in contact with) are tuning in and checking their news feed as often as they do because they enjoying seeing their friend’s and families’ activities or they are gathering news and other relevant information. You may notice that your social media sphere of influence is sharing things they find funny or important to them. Your company’s social media account is a way to communicate your brand and to grow your client base. Social Media gives you a chance to spotlight your company’s wins and culture in a non-selling, un-promotional way. It’s PR that has a great ROI. In the first photo, their post celebrates their employee, gives him kudos for his professionalism, and pokes fun at a possible inflammatory situation. 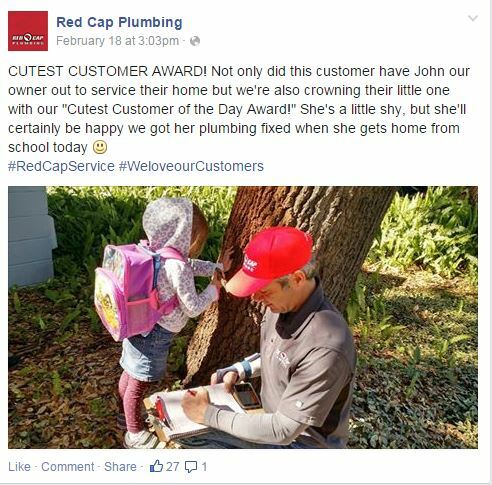 In the next post, Red Cap Plumbing celebrates their customer. They understand the importance of fun and relevant posts! Their audience probably feels good vibes from the company and will be more likely to support their business. Red Cap has figured out how to interact in a positive way that is interesting to the audience about a service that is essentially, not interesting. 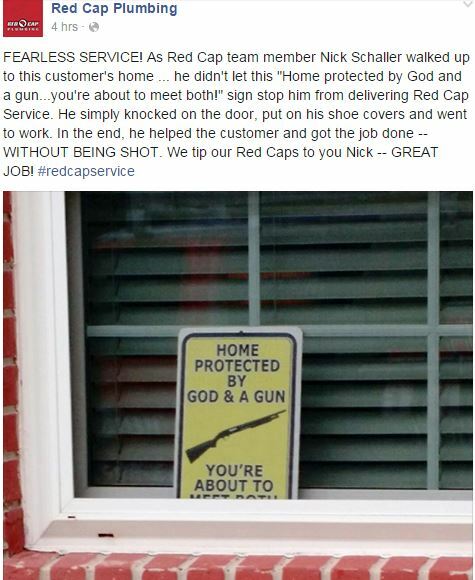 Makes you look successful – You can celebrate the smallest of victories like Red Cap did for their employee in the example above. It will help you to recognize the weekly achievements as well as the longer term strategies accomplished. Internal motivation – The positive will encourage sharing and interaction with your employees. People love positive recognition! Generates press and opportunities – Focusing on achievements will help you hone in on what is worth sharing with the media and press in your area. Focuses on the positive – It helps you to create a company culture that is always looking for the positive. Positive work environments correlate to increased happiness and productivity within your company. Inspires other marketing materials – These posts might become the inspiration for other more traditional channels of marketing. Your company’s Facebook page is your chance to share your brand’s message on a daily basis. Start celebrating your wins and you will see the power of social media. According to recent marketing research, photos makeup 93% of the most engaging posts on Facebook. Maybe it’s because; the brain processes visual data 60,000 times faster. While website links or YouTube videos might be relevant or interesting to your brand, people aren’t likely to share them. Grab your audience with a photo and they will share with their network allowing you to reach new people. 2. 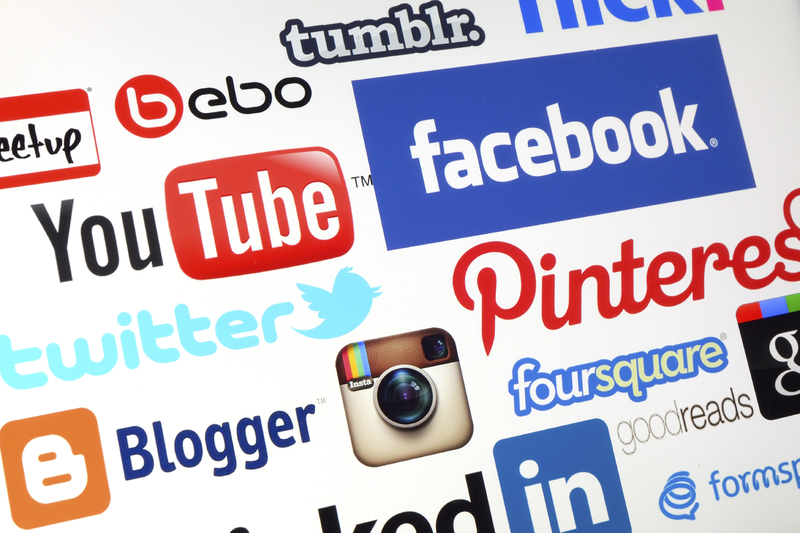 Plan out your top social media outlets for postings. When developing your marketing plan, you will need to identify the top social media outlets that are the best fit for your company. Social media gives people the illusion of personal conversations so if you post the same info across all your social media outlets, you will lose the conversational approach. For instance, tailor your Twitter tweets to the twitter audience. A tweet includes a shorter message, but with relevant #hashtags and interaction with key people interested in your content. Also, since the newsfeed shifts so quickly, you can re-post a blog link several times, but try that on Facebook and people will be turned off. Did you know that B2b companies that blog generate 67% more leads than those that don’t! In fact, it’s so important that we devoted last month’s entire blog to the subject: Click here to read Content Marketing – Blog Writing. 4. Don’t be a robot. For time efficiency, you will need to automate some of your social media postings. However, there must be a real live person engaging the audience, sharing info, growing the site, and handling any positive or negative feedback. People want to think there is a beating heart behind your brand. According to Social Times, customer testimonials have the highest effective rate in social media sharing at 89%. The great news about this is that these are so easy to share on social media! Post the positive, support it with a picture, and you just graduated from PR101! Let’s face it; it’s a full time job keeping up with content marketing. We will develop a content marketing playbook for you,and track metrics to support its effectiveness. Because we are a small firm we can shift the plan based on results, and find deep engagement with you target audience. The potential of content marketing via social media is endless. Isn’t it time you tested the waters? It is scientifically proven that goal setting has a direct correlation with productivity. Goal setting can be energizing and motivating to yourself and your employees ensuring long-term success and loyalty. But many companies, especially small businesses, set clear goals in the start-up phase of their company only to lose their goal setting time as the day-to-day operational needs consume their day. Hiring a marketing company can be a great way to help you set clear company goals to meet long-term strategies. Marketing companies are experts at looking at businesses and evaluating how to create potential growth strategies. How has my year been? Where do I want my business to go? Do I have specific goals for the upcoming year? What is my game plan (PLAYBOOK) to get me to where I want to go? Sometimes it’s difficult to answer these questions and manage a business and employees. It’s amazing what a difference an objective perspective from a third-party can bring. At Playbook, we study our clients businesses and help provide an external perspective. We help quantify the brand value from a target market perspective and then create and implement a comprehensive marketing and PR plan. Our strategic alliances within the media and digital communities, ensure our clients get the best possible bang for their buck. We stay current on all the latest trends, so our clients can focus on running their businesses and doing what they do well. We ensure that their marketing and public relations strategy helps them meet company goals. The best companies have very well laid out business goals that align with all aspects of design, marketing and brand image. Playbook is grateful that our team of creatives love their work. This passion translates into beautifully designed marketing collateral pieces. Never underestimate the correlation of quality design and revenue. The best agencies will help you define your business goals and ensure that the marketing and PR strategy will help you achieve them. If you are “winging it” or know there is more that your company can accomplish in the upcoming year, then consider outsourcing some or ALL of your marketing and PR in 2015. In all likelihood, your time is probably better spent on doing what you do well. Let us help you take your business to the next level. Lastly, there is the another upside of hiring a marketing firm, we help you stay accountable for hitting goals and objectives. Playbook’s business depends on keeping our client relationship strong and growing their businesses. The more goal achieving clients we have, the more Playbook grows and profits. Marketing experts are talking about how to reach Millennials, people born between 1981 and the year 2000. And they should be. This group is the largest market segment in our society today totaling over 80 million people, surpassing the size of the baby boomers and the GenX groupings. Millennials have careers and money to spend. However, because of the way our society consumes information and data marketing to this group is very different than marketing to the Baby Boomers or even to GenX. Today’s technology (i.e. 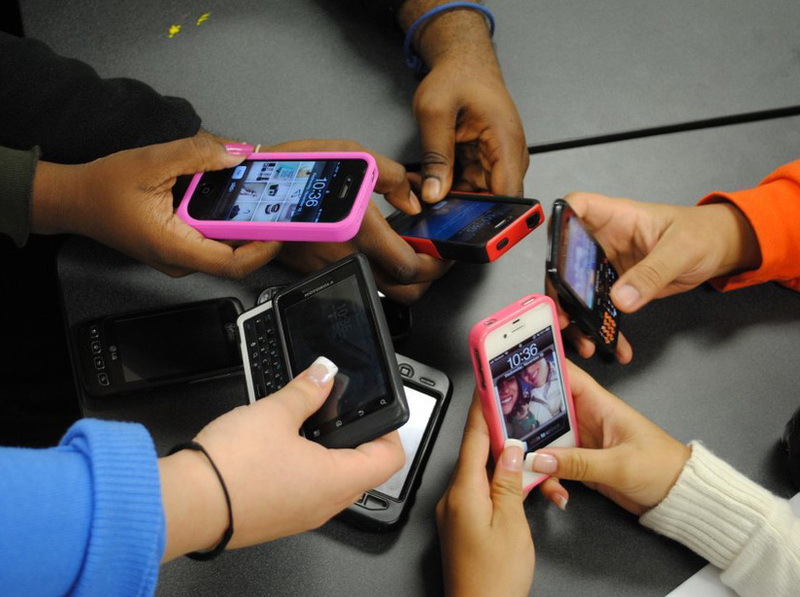 tablets and smartphones) quickly links us to our friends around the world. According to data gathered from AD Week, the majority of Millennials own tablets and smartphones and check into their devices on average about 48 times a day. Millennials tend to reject the traditional marketing paths of the past. You are not going to reach this consumer with a celebrity spokesman on TV or a gimmicky mailing campaign. They tend to reject this sort of marketing message and in turn will ultimately reject your brand. If they do reject your brand, watch out because they will share their feeling socially. In fact, Millennials share more of their brand likes or dislikes than any other consumer group. Social sharing and recommendations from their family, friends, and even anonymous online reviews influence their buying decisions. So how do you reach this group? 1. Create a mobile ready website. There is a more than 68% chance that your website will only be seen from a smart phone, or tablet. Your website should be easy to navigate from a mobile device, or it will render itself useless to an entire generation. 2. Create a social media strategy. 42% of Millennials log on to Facebook daily, and over 60% follow brands on Facebook. Create a social media strategy that increases your interaction with your target market. Decide what outlets you need to be on and keep at it with a consistent message. 3. Create authentic interaction and monitor what is being said about your company. Be real, or at least appear that way by limiting the gimmicks and false claims. Since Millennials trust recommendations more than claims by brands, you need to be well aware of your testimonials and what people are saying about your brand online. With Millennials, the focus needs to be on technology and creating an authentic, intimate brand experience. Your website has to be mobile ready and easy to use. You have to have a brand presence across all social media channels or your brand risks becoming irrelevant to this large consumer group. For help making your website mobile ready, social media management, and increasing your word of mouth PR, call Playbook today! 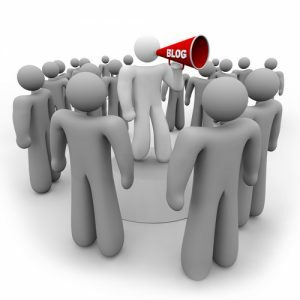 An effective business blog has the potential to result in companies gaining, on average, a 55% increase in traffic. The more often you post, the more often Google indexes your site. If you think of your website as your companies store front―windows for the would-be customer to look through to see what you offer―think of your blog as a window to your company’s soul…and personality. It’s here where you can truly connect with your current and potential customers. We don’t buy a product or service that we don’t understand or believe in. How does it work? What does it do for me? Without the answers to these questions, it’s difficult for a consumer to take action. A blog gives us the know-how…and the access. When was the last time you followed through with purchase based on something you read in a magazine? Did you clip the article and carry it with you to the store? Probably not. Blogs are 63% more likely to influence purchase decisions than magazines. What’s the expression? You can never be too thin or too rich…or have eyelashes that are too long? Add “you can’t have too much content” to the list. Give me more. If your business has 40+ different landing pages, you’ll generate ten times more leads than the slackers with less than six pages. And once you get that blog post tally up above 200, you’ll generate three and a half times more leads than those who have less than 21 posts. 200 may seem like a daunting number, but start today and it will be here before you know it. If Blog CONTENT IS KING, then social media users make up its vast Kingdom. And what are folks flocking to social media for? When Twitterers were surveyed about why they follow certain brands, “Interesting Content” came in at number three. What are you waiting for? Curious about QUALITY content marketing? Contact Playbook Public Relations, LLC today. First and foremost, PR has changed. Many business owners have a misconception that Public Relations (PR) is only a strategy for large companies, who can afford to spend big money to manage their brand. However, in reality, almost every kind of business needs a PR strategy. Today most of us do online research before we make a purchase. Search engines have leveled the playing field for small and medium size businesses to compete with large companies on a local level. Suddenly small businesses are visible on search engines and engaging with large audiences via their social media sites. The way your brand is represented on-line is modern day PR. 1) Brand Alliance – Your online presence represents your business in a way that matches your company’s mission and values. 2) Happy Customer Social Engagement: People are satisfied with their experience with your company and are sharing that message. Are you actively monitoring your social media sites to see how your customers really feel about your brand? This is called Online Reputation Management (ORM). 1) Press Releases – Share your press release with a wire service and on your social media sites. This kind of sharing will increase traffic to your website and boost your site’s search engine ranking. 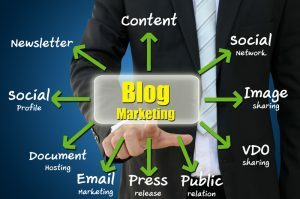 2) Blogging and Guest Blogging – Blogs are important because they allow you to share your expertise and become a trusted source of information and because they will help your SEO efforts. It is important to write a keyword-targeted blog on a frequent basis. If you are not a good writer, hire a company like Playbook who can take your ideas and formulate them in a meaningful way. We will also help you develop relationships with other bloggers and key social influencers, which give you the ability to share and expand voice. 3) Social Media Content – An effective social media strategy that produces quality content will help your SEO efforts. 4) Add a Press Section to Your Website – Keep a section on your site that you keep updating with all your press links, and everywhere you have been featured. These links will increase your SEO efforts. Google alert will help you keep track of all your press. With over 131 billion searches per month on the web2, it is vital you get your company seen on-line. PR & SEO are cost-effective, long-term strategy to increase your visibility online and in the marketplace. Happy Thanksgiving for Playbook Public Relations, LLC! As small business owners, we’re thankful to have survived our first year in business with minor scrapes and bruises and many more successes than gripes. At Playbook Public Relations, LLC, we’re particularly thankful for our clients, many of whom are also small business owners. We’re thankful for their business and thankful for the valuable services they provide to the community. For example, as a licensed psychiatric social worker, Robin Leigh Maier helps her clients better their lives by finding emotional health and happiness. Every Wednesday, Robin shares her wisdom in her weekly blog, discussing topics such as managing A.D.D. and handling the Holiday Blues. Randy Clark and Kevin Wade are instructing students so they can launch new careers in the health care field. These bright students at the Center for Neurosomatic Studies (CNS) will in turn, will help their patients live pain-free lives through the practice of Neurosomatic Therapy. You can learn more about CNS at their Open House on Sunday, December 9th. The team at Florida Property Title Services is facilitating an important part of the American dream, home ownership. We helped them launch their new mobile ready website. Please check their website at www.FlaPropertyTitle.com. Of all small business owners, only 10% earn revenues greater than a million dollars annually. We understand that owning a small business doesn’t always equate to big earnings. 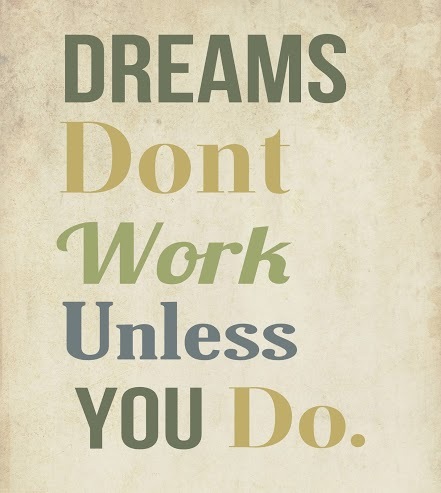 It does, however, always require long hours and hard work. It’s a labor of love. But that’s part of the American dream that we love being a part of. At Playbook Public Relations we are thankful to live in the United States, a country built on entrepreneurial spirit and determined work ethic, which is still found in American business today. We are thankful for all of our clients, big and small. Please share with us what you are thankful for!